This post originally appeared on The Signal on November 23rd, 2016. 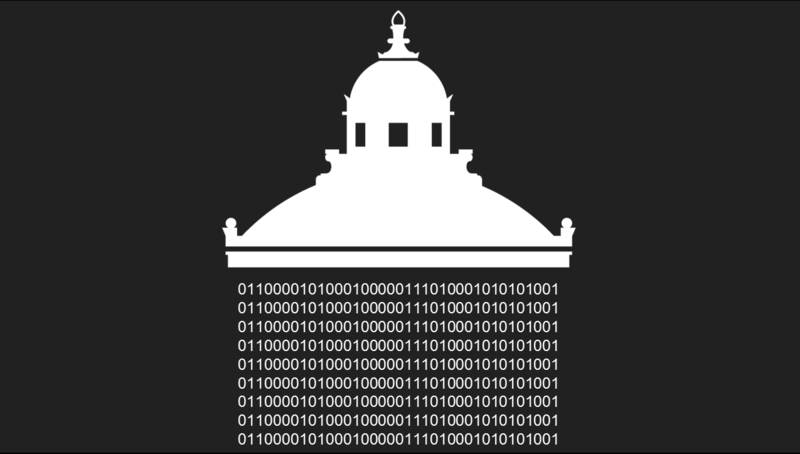 Here’s the text of the presentation I gave during the Initiatives panel at Digital Preservation 2016, held in collaboration with the DLF Forum on November 10, 2016. This presentation is about what the National Digital Initiatives division has been up to in FY16 and what’s coming up in FY17. For a report on the DLF Forum, see this Signal post. Hello! 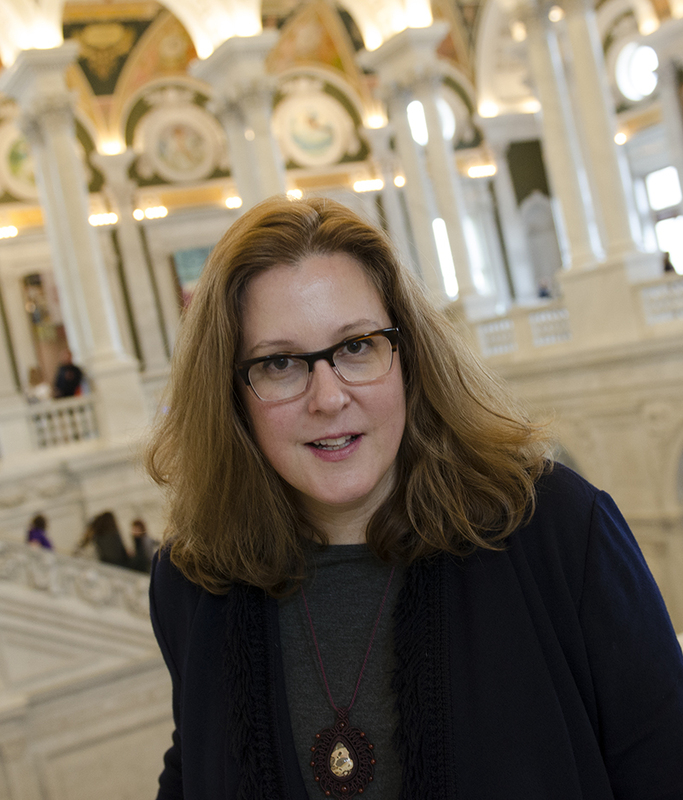 I’m Jaime Mears and I am from the Library of Congress, with National Digital Initiatives, a division of National and International Outreach. Among our goals, we are looking for strategic partnerships that help increase access, awareness and engagement with our collections. So, as I present what we’ve done and what we plan to do, please think about whether there may be any synergies with efforts at your own institution. 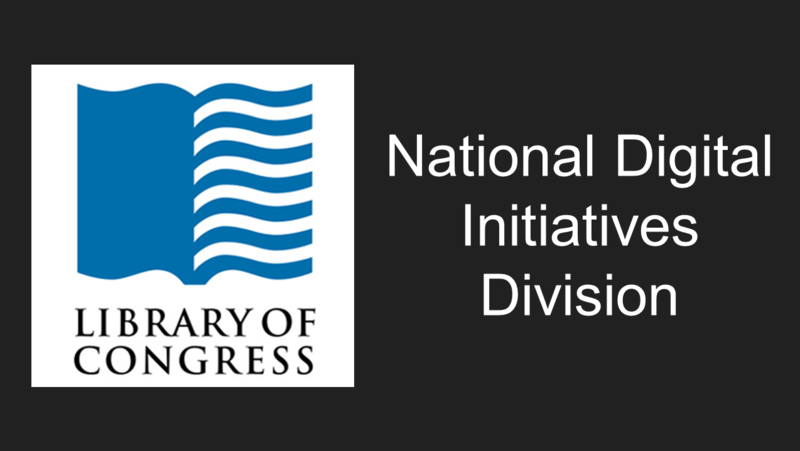 National Digital Initiatives is a small and agile team created in 2015 to maximize the benefit of the Library of Congress’ digital collections. 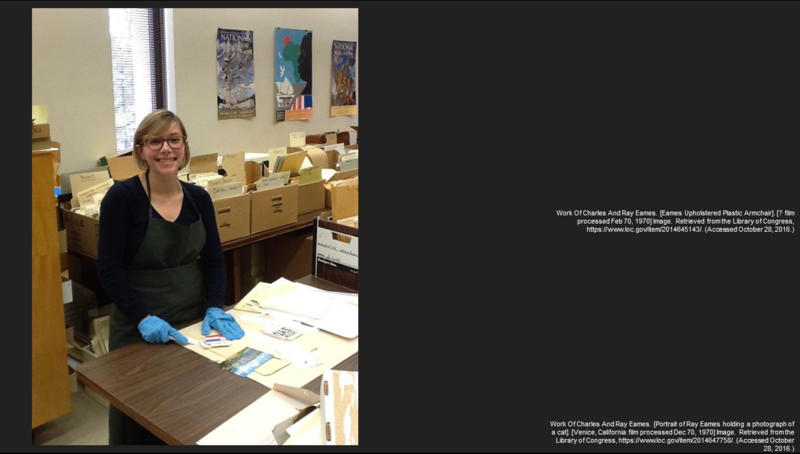 Kate Zwaard, our chief, previously managed the Digital Repository Development team and led efforts to ingest three petabytes of digital collections. You may have come across some of Mike Ashenfelder’s communication work with the Library from The Signal, and Abbey Potter was formerly an NDSA organizer and a program officer for NDIIPP. I’m the newest member of the group and I was hired fresh off of my time as a National Digital Stewardship Resident, where I built a lab for personal digital archiving. I’m not new to the Library though. 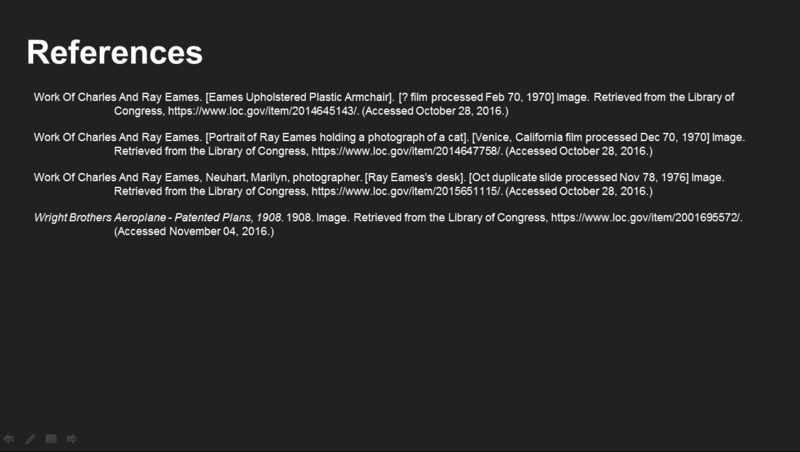 Back in 2012, I worked as intern for about eight months in the Manuscript Division, where I had the privilege of helping process the Charles and Ray Eames collection. The Eames’s are makers of the Eames chair and various modern works of art across formats like film, graphic design and architecture. In an effort to impose order at Ray’s office at their design studio in California, Ray’s team used to clear her desk periodically, put everything in a shopping bag, large envelope, basket, silk scarf or whatever was handy, and slap a piece of masking tape on it with the date. In processing the collection at the Library, the decision was made to preserve these bundles as Andy Warhol-esque time capsules. It was my job to go through these bags and essentially help make them accessible for researchers. The strategy was to group together provocative pieces and pieces that were indicative of the color palettes or design themes she was collecting at the time into arrangements to entice someone to investigate the rest. Sort of like a visual index into the capsules. Four years, three library jobs and one MLS degree later, I’m back at the Library of Congress and I recognize that even in this new role I’m still doing something very similar with the National Digital Initiatives team: provoking exploration, getting users to engage with the Library’s material and staff and surfacing important work that often goes unseen. We try to highlight digital projects happening across the Library. 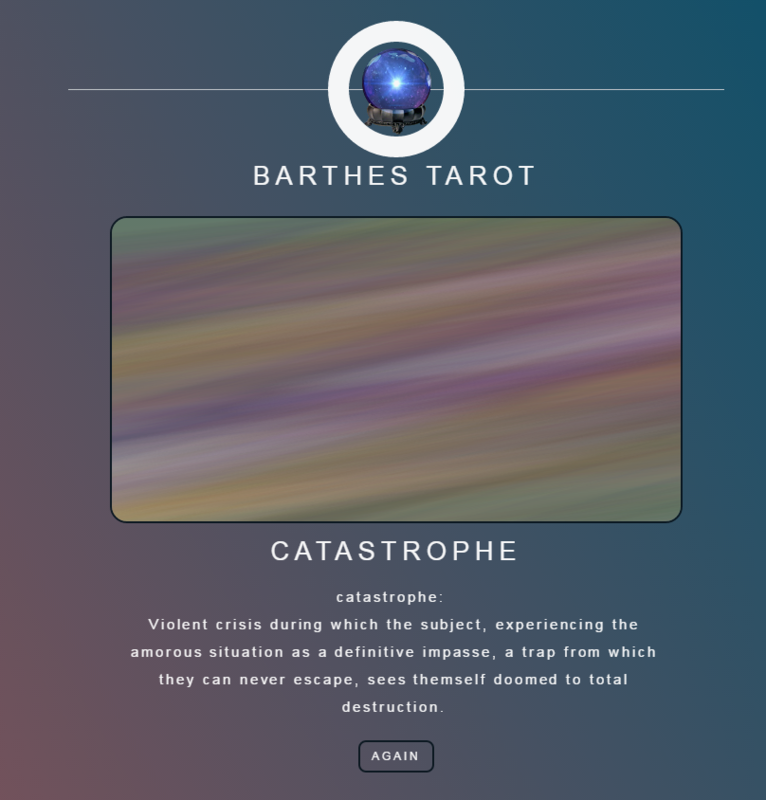 For example, here is the debut of the Library’s new homepage, the first of many roll outs of a massive site redesign. 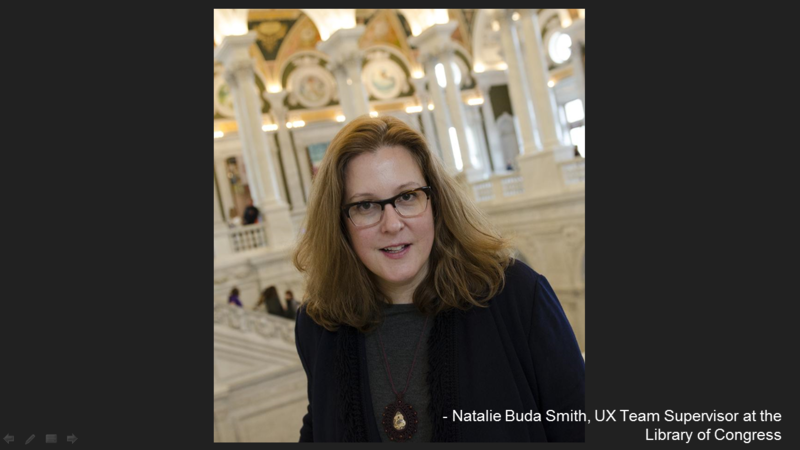 This is Natalie Buda Smith, the supervisor of our User Experience team that is working on this redesign. I had the pleasure of interviewing her for the Signal last month and we discussed what it’s like to do a redesign like this for the Library of Congress, which has had a website for over 20 years. Because the Library of Congress was such an early implementer of digital collections, the growing pains of refreshing the interface and making the collection easily accessible can’t be understated. 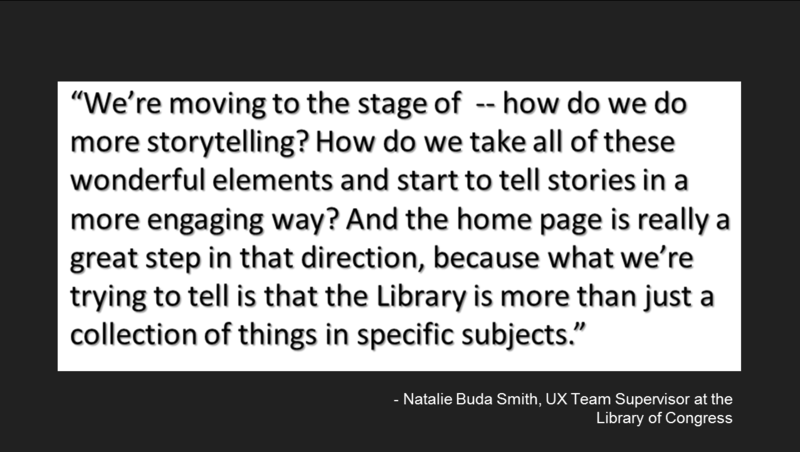 One of her goals is bringing a sense of joy of discovery to the user, and part of her team’s strategies for the homepage was to tell a story as a way of showing that we are more than just our holdings. So what other strategies does NDI use to tell stories, to provoke, to invite? How do we show that the Library is more than just a collection of things in specific subjects? There are multiple strategies; I can’t call them buckets because they’re not mutually exclusive. 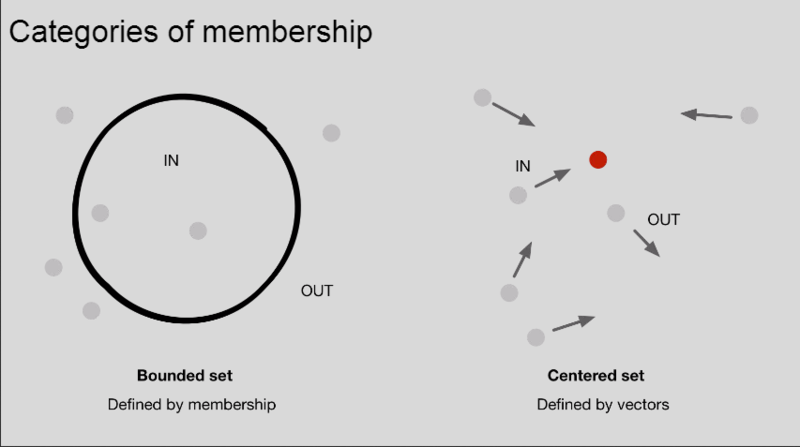 In fact they tend to build on one another, bleed together and most importantly all depend on multiple stakeholders both in and outside of the Library to be successful. We host events, we highlight collections, we highlight our efforts and those of our colleagues internally and externally, we develop programs, we facilitate experimentation and investigation (usually the final product is a report or example project) of our digital collections and we partner with outside GLAM practitioners. 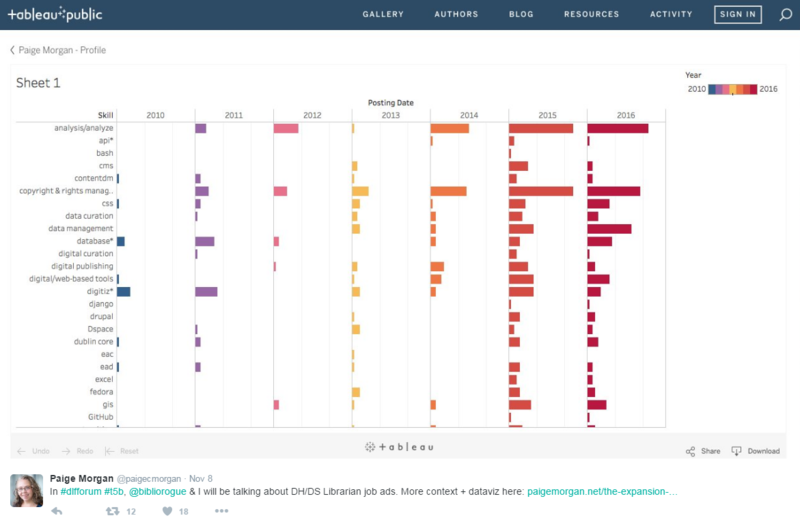 In time, we hope to include data journalists, artists, local community organizations and lifelong learners. Our team is dedicated to a “ rising tide lifts all boats” philosophy. I will discuss six initiatives that we did this year and then — at the end — layout our game plan for FY17. 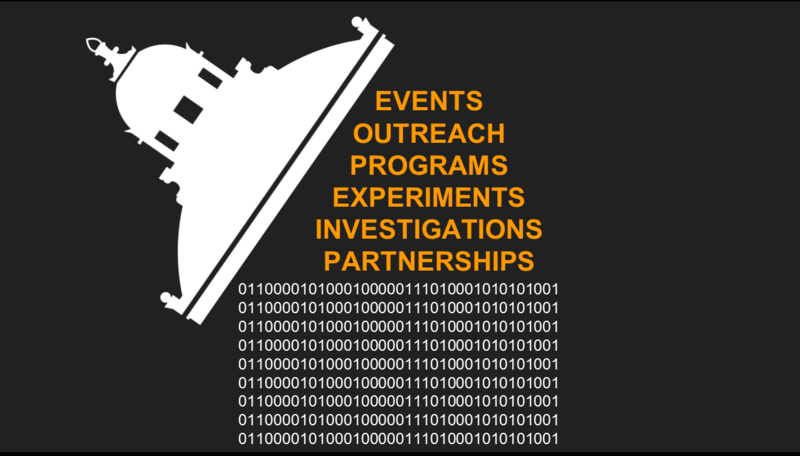 We began with a basic question – “Who out there was using our collections?” Traditionally, most units have done this through monthly web metrics reports but we wanted profiles that were more detailed, to give us some direction in our outreach. We partnered with our communications office and Library Services, and came up with three priority areas we wanted profiled: two about types of audiences (undergraduate and graduate students, writers and creative professionals) and one about content (who was using our public domain and rights-cleared content). We hired a marketing firm to build profiles of these priority areas and we learned important user behavior trends and ways that we could target these groups. We will use the information from the audience analysis to help design and execute a digital-outreach campaign for existing and upcoming LC digital collections. 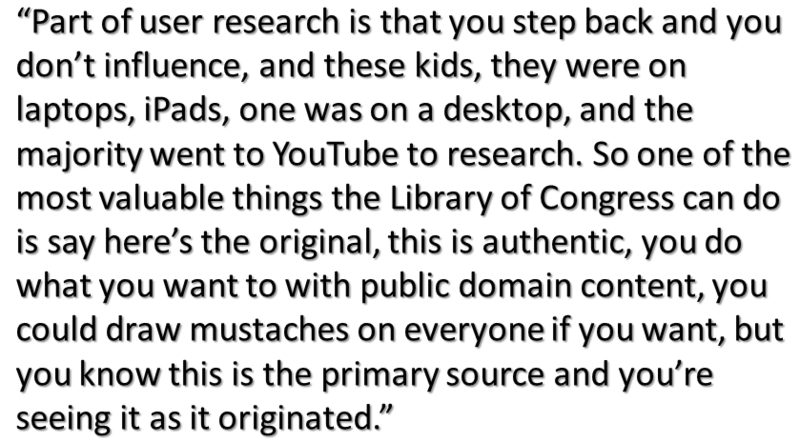 To facilitate experimentation and investigation of some of our dark archives, we partnered with the Library of Congress Web Services and the Law Library, and the non-profit Archives Unleashed (Ian Milligan, Matthew Weber and Jimmy Lin). 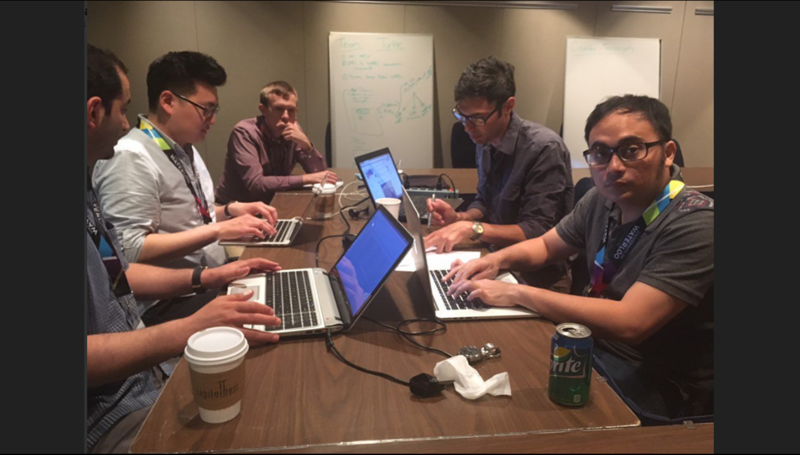 Together we hosted the Library’s first hackathon. Scholars came from around the world and had two and a half days to partner up, form a query, choose data sets to investigate and present their findings. You can read about this event on The Signal. This was the first time some of our web archives had ever been used by researchers. 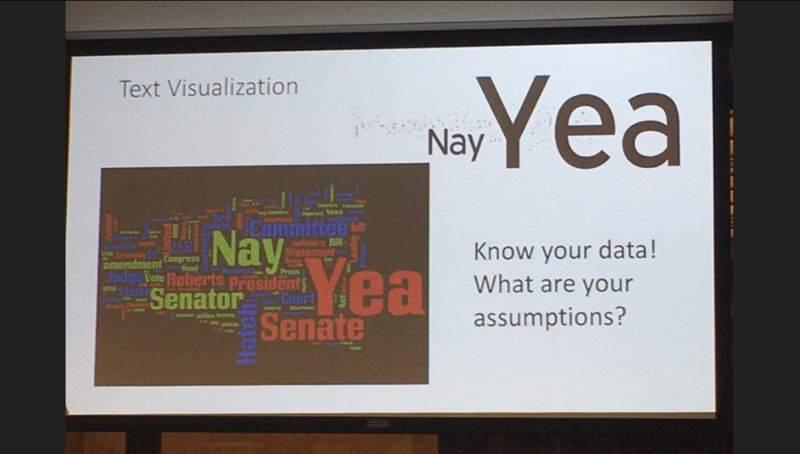 Here you see a word cloud that one team generated of Supreme Court nominations. 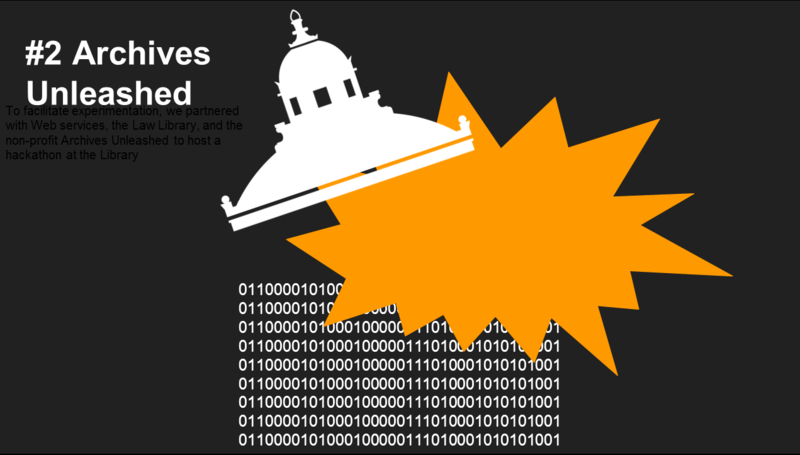 We discovered that there was a Justice Roberts and a Senator Roberts, which threw off our text-mining efforts. Law Librarian Andrew Weber was on this team and gave context to the researchers about why they were seeing skewed results in the word cloud. That was a great example of engaging curators with the researchers. 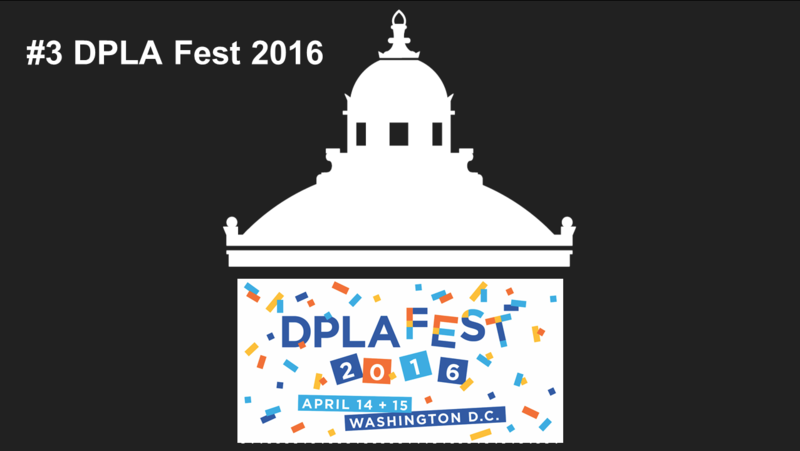 We co-hosted DPLA fest in 2016 with the National Archives and Records Administration and the Smithsonian Institution. 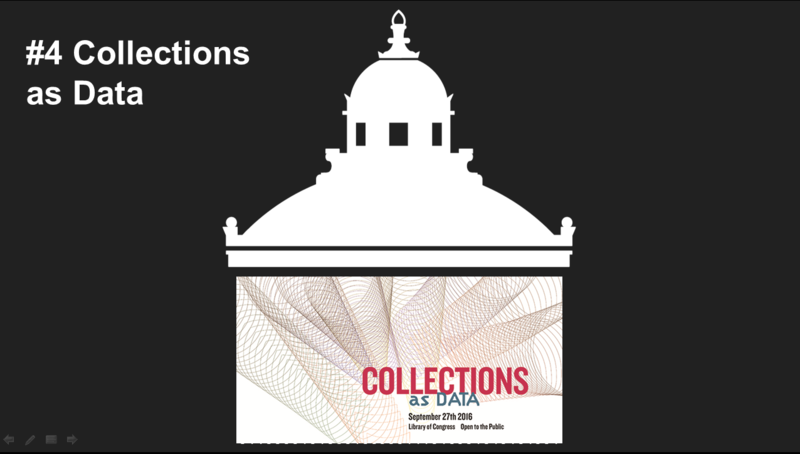 We hosted a summit in September called Collections as Data. You may have seen it on Twitter as the hasthag #AsData. We invited leaders and experts from organizations that are collecting, preserving, using and providing researchers access to digital collections that are used as data. We asked them to share best practices and lessons learned. 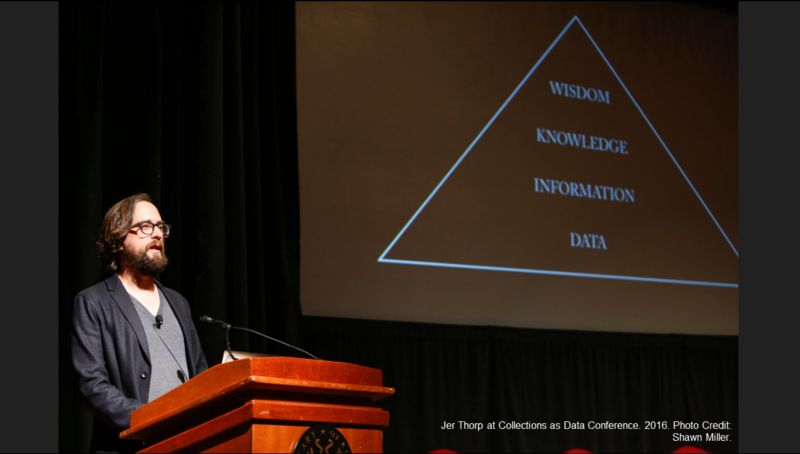 The event featured speakers such as data artist Jer Thorp of the Office for Creative Research, data curator Thomas Padilla at UC Santa Barbara, Maciej Ceglowski of Pinboard and Marisa Parham, director of the Five College Digital Humanities Project. produce design that is falsely interpreted as neutral. Solutions suggested during the day included collecting and describing data sets with creators, cultivating diverse user communities to benefit from the data, and being transparent about decisions taken by libraries as they make these sets available. 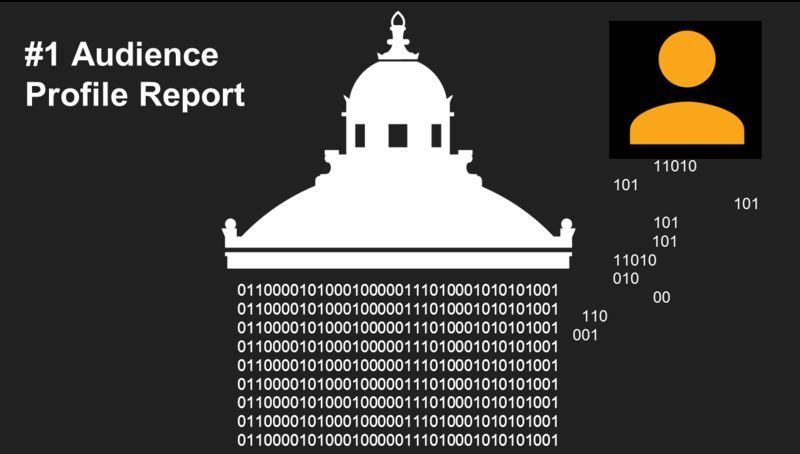 So far the archived streamed video has been viewed over 8000 times, so we feel that the conference registered with a lot of people who are thinking about how to support data scholarship. 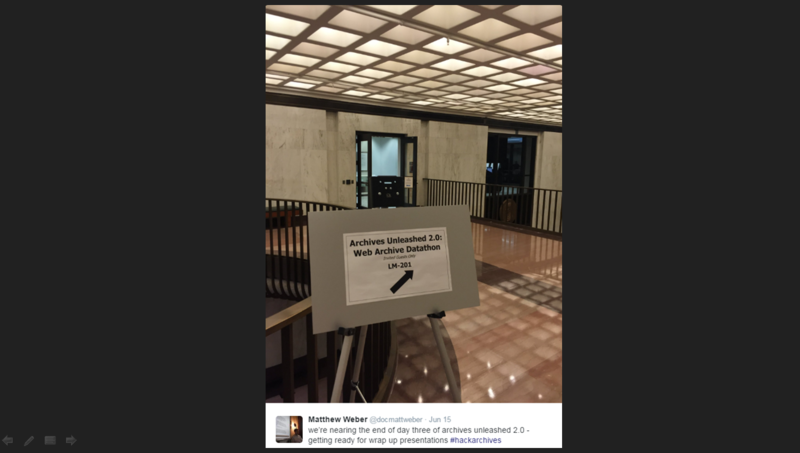 The day after the conference, we brought together 30 Library of Congress staff members and 30 invited guests to discuss how the Library could improve data scholarship. We are currently working on some of those recommendations and looking into partnerships. 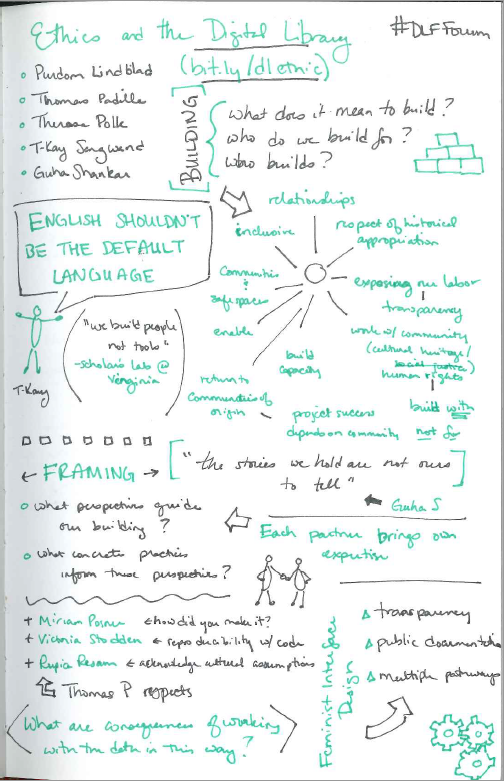 We will publish a report on the conference next month by Thomas Padilla, as well as a series of visualizations by Oliver Bendorf. 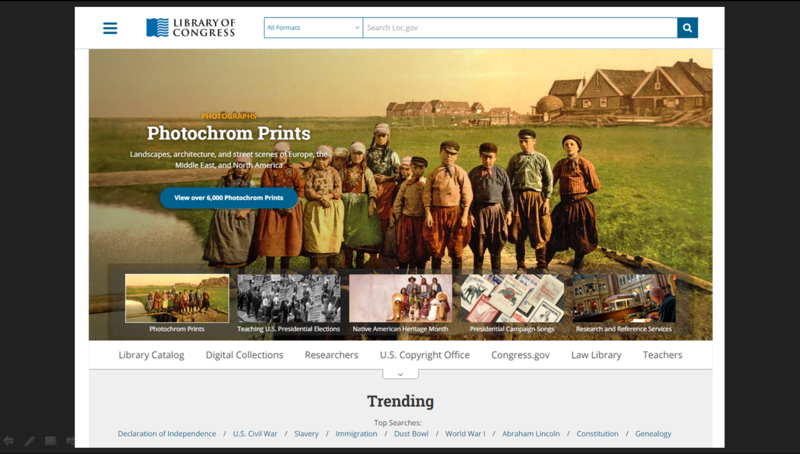 We opened an internal call for staff to apply to experiment with Library of Congress digital collections on a part-time, temporary assignment. 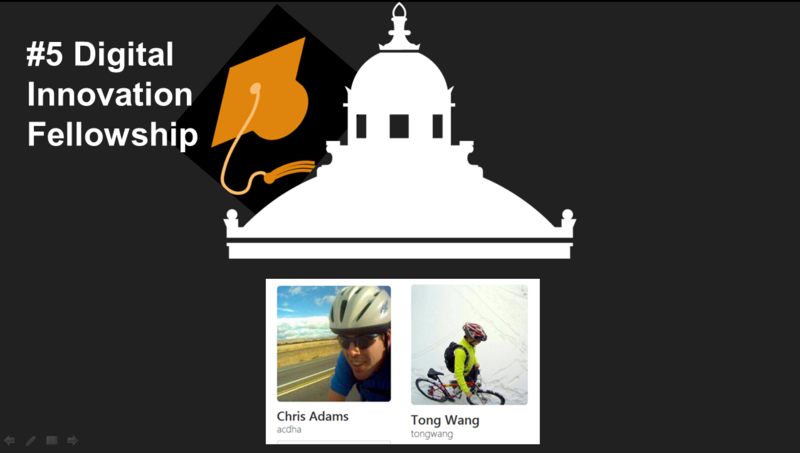 We had a number of colleagues apply, and chose Tong Wang, a repository developer and Chris Adams, a developer from the World Digital Library, to be our inaugural fellows. Seeing our developers use the privilege of time to explore the collections and play with them was a really joyous part of this year for us. We hope to expand the program to a wider, external pool of applicants next round. We asked two outside experts to do a proof-of-concept for a digital scholars lab in partnership with the Library’s John W. Kluge Center. The Kluge Center hosts a number of senior scholars and post-doctoral fellows, including most recently Dame Wendy Hall. Our goal in this pilot is to demonstrate what a lightweight implementation of using collections as data could look like. There will be a workflow to demo with some of our web archives. If you’ve seen a theme rise out of these initiatives to increase engagement with our collections, you wouldn’t be wrong. 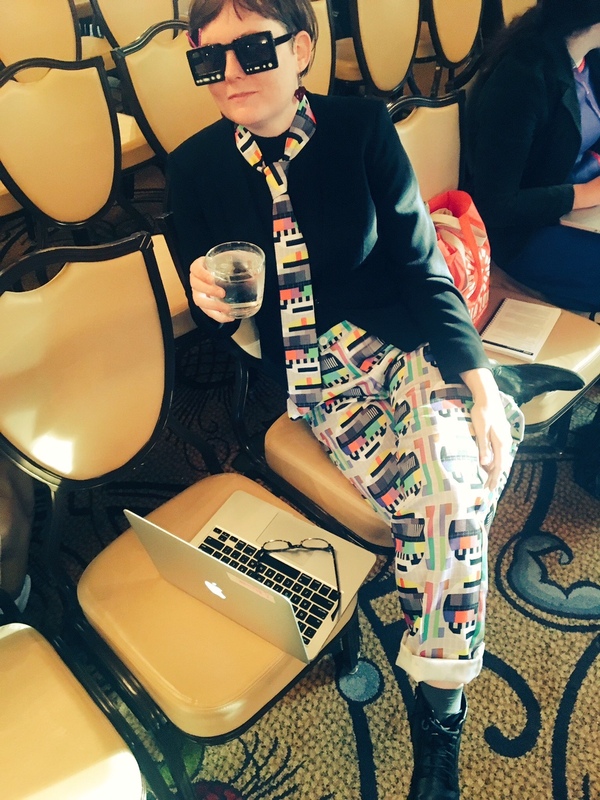 Our focus right now is enabling computational use of our digital collections, although we foresee year to year these themes changing depending upon what’s happening in the GLAM community at large or internally at the Library where we could best be helpful. So what’s happening now, coming up? 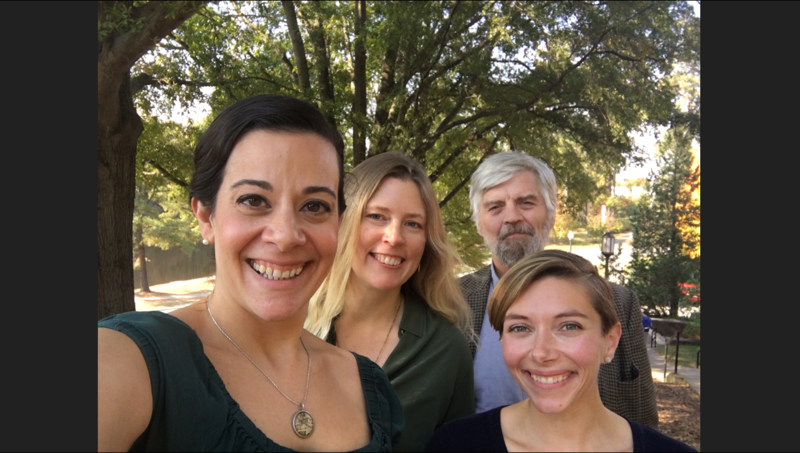 Library Innovation Fellowship: As you heard before, we opened this up internally last year, but we are currently investigating funding approaches and hope to complete the fellowship this year. 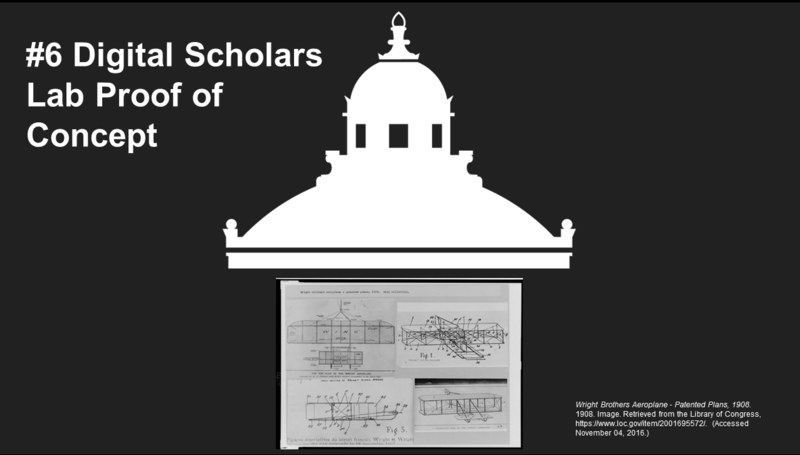 Digital Scholars Lab Implementation with the Kluge Center: Final report and pilot for the Digital Scholars Lab will be done by the end of December, and we will leverage those recommendations to begin piloting enhanced support for digital scholarship in the Kluge Center. Lab Site Visits: We visited MITH, DCIC and the University of Richmond’s Digital Scholarship Lab, and we will continue to visit labs in libraries, archives, museums and media through the year along the east coast to learn how they are serving collections as data and engaging their communities. 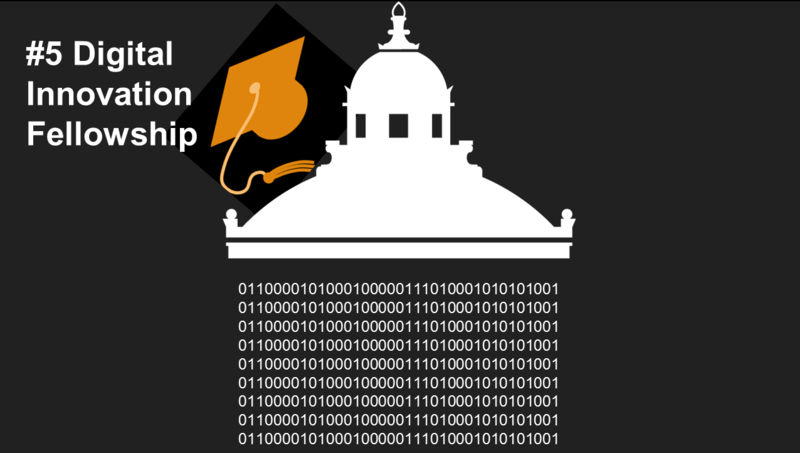 Hackathon: We are currently co-organizing a hackathon for the spring that will include an introductory workshop on analytical tools and methods. Annual Summit: Following on the success of the Collections as Data summit held in September 2016, NDI will host another conference in a similar style. We’d love to hear suggestions about topics. 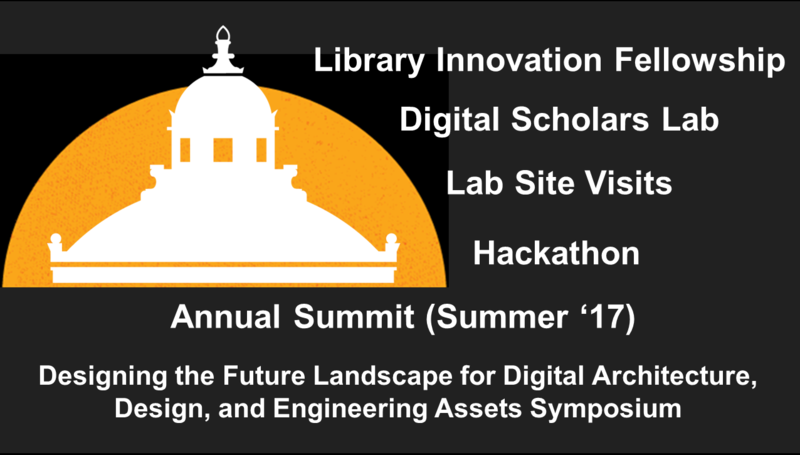 Architecture Design Environment Summit: We will partner with other Library of Congress divisions to host a symposium next fall exploring preservation and access of Architecture, Design, and Engineering software and file formats. Partnership Development: Last and most important, we are looking for opportunities to collaborate. Do you have a lab that we could visit? Are you or your colleagues interested in co-hosting a hackathon with us? Are you also looking to enhance access to your digital collections and want to connect? Talk to us. As you’ve seen from some of the things we’ve accomplished, they have all been through collaboration. You can email us at ndi@loc.gov. You can also check us out on The Signal as we write about our initiatives and other cool digital projects happening at the Library and in the broader GLAM community. Thanks so much.